Dr. Poonam Jain is currently associated with Regency Hospital as a Consultant a Gynecologist and Obstetrics. 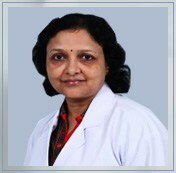 She has also worked as a Consultant Obstetrics and Gynecology at CMC Hospital, Vellore, Tamil Nadu, 1991 to 1994. Management of patients during pregnancy and delivery with special interest in high risk pregnancy like Hypertension, Diabetes, Thyroid Disease, RH Negative, Bad Obstetrics history etc. Problems related to female urinary systems.